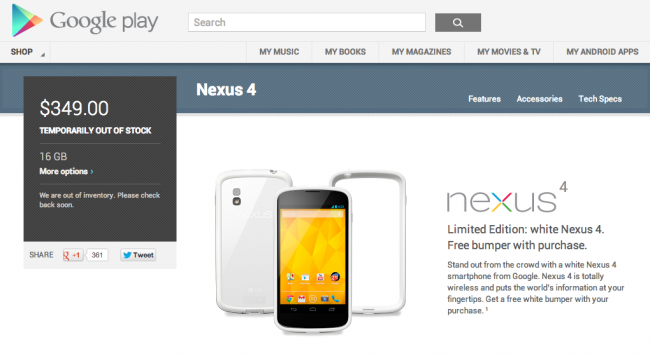 The limited edition Nexus 4 in white is now unavailable in both 16GB and 8GB sizes through Google Play. The 8GB version was wiped out last week, but the 16GB version managed to hold out until moments ago. Since the white variants were deemed “limited,” it makes sense that Google would run out of inventory. The good news is that the 16GB version is listed as “temporarily” out, meaning there is a chance that they will have more in the near future. We’ll try to update you as we see changes in inventory.